Brown rice flour is made from brown rice. Because of this, brown rice flour can be gluten-free, but you should check the packaging to make sure. 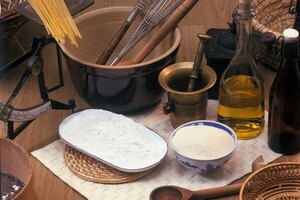 Brown rice flour can be substituted for conventional wheat flours in a number of preparations, especially sauce thickeners like roux. It has a stronger, nuttier flavor than conventional wheat flours. Brown rice flour behaves differently from conventional wheat flour when baked. Brown rice flour works best in breads, muffins and cookies. If you are merely looking to add nutritional content to your baked goods, you can choose to substitute 1/4 of the conventional wheat flour called for in the recipe for brown rice flour. This will make your baked goods a little brittle, but also richer in fiber. 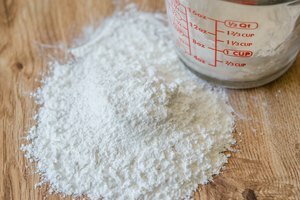 Choosing how much brown rice flour to use depends upon which flavors will work best for your recipe. 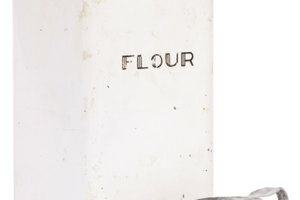 Some flours may not be right for all recipes. To compensate for the lack of gluten in brown rice flour, you will need to add ingredients that will help your baked goods to cohere. Some cooks add an additional egg; others use apple sauce or additional oil. If you are substituting brown rice flour by itself, adding additional liquid is important. Rice flour absorbs more moisture than conventional wheat flours, so you may need to increase the amount of liquids in your recipe. If you notice that your dough or batter is too dry or gritty, try adding 1/8 cup of liquid as needed to your mixture until it achieves a smoother consistency. If you are using a rising agent, be advised that brown rice flour baked goods tend to rise very quickly. It is best to check your dough frequently rather than relying on the time your recipe says it will take for your dough to rise. Do not let your brown rice flour dough rise for too long or it will fall apart when cooked. Refrigerate your dough or batter for 1/2 an hour before baking---this will improve its texture. Brown rice flour products should be baked at a lower temperature than conventional products. Lower your oven temperature to 25 degrees less than what your recipe recommends. Cook your baked good until a toothpick inserted into its center comes out clean. Brown rice flour should be stored in an airtight container in your refrigerator---it spoils easily due to its high oil content, and can take on odors from other foods you are storing. Brown rice flour is darker in color and rougher in texture than conventional wheat flours. However, it is much higher in B vitamins, iron, and fiber. Baked goods made with brown rice flour can be more crumbly than those made with conventional wheat flours, so you may need to add binding agents like arrowroot powder or additional eggs to your recipe in order to make your baked goods more cohesive.